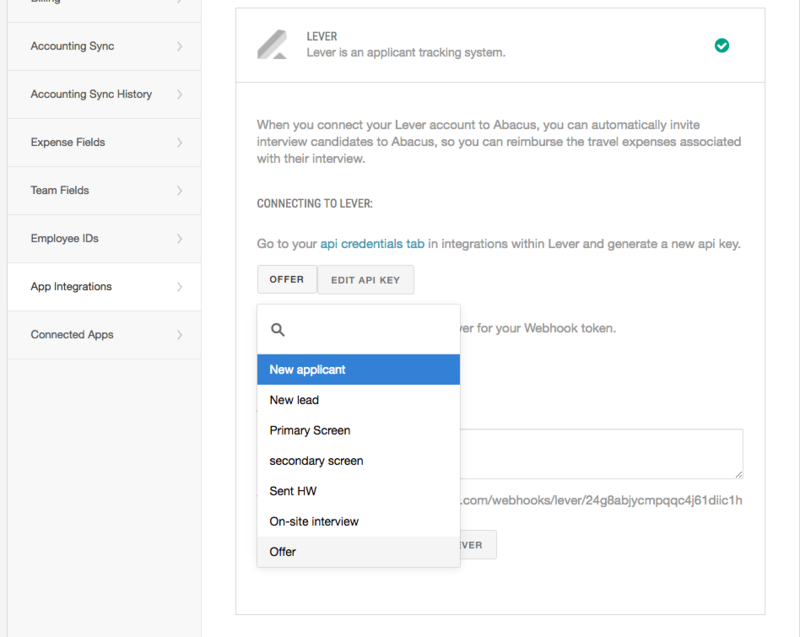 If you use Lever to manage your interview candidates, you can set up a direct integration between Lever and Abacus that will automatically invite people to Abacus when they reach a certain interview stage in Lever. For example, every time you move someone to "on-site interview" in Lever, that person will automatically receive an invitation to join your organization's Abacus account. Click the toggle next to Abacus's logo. Click the blue "Generate New Key" button to display the API key. Open Abacus and navigate to your App Integrations page. 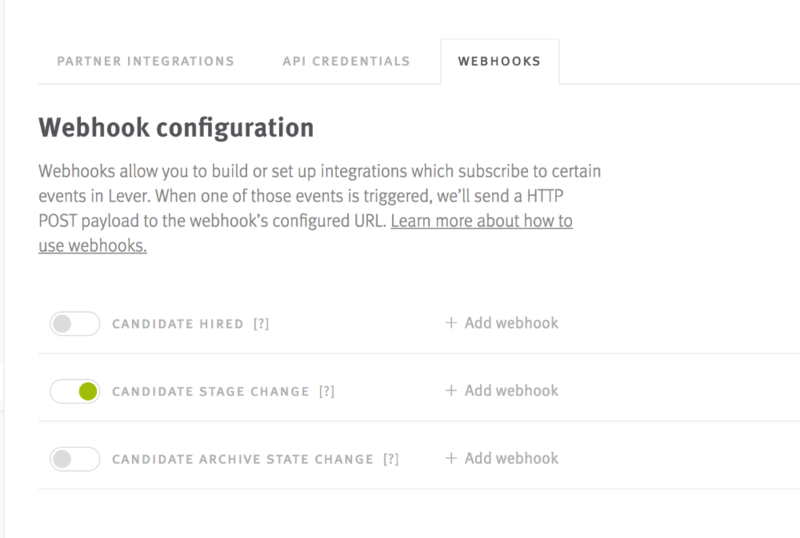 Paste the API key and then click "ADD LEVER"
Back in Lever's settings, click on the Webhooks tab at the top. 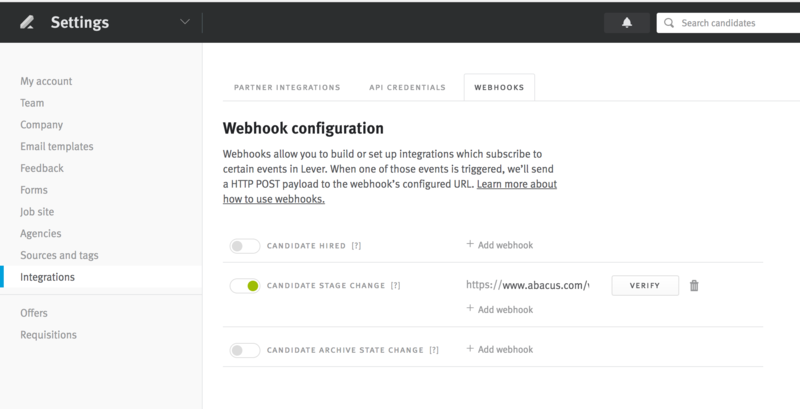 Go back to Abacus and copy the Webhook URL. Add a standardized note to your invitation emails. This note will be included in every Abacus invitation that is sent out. Click the blue SAVE LEVER button. This is the stage in Lever that will trigger an invitation to Abacus. Most companies will select the "on-site interview," so that once a candidate is moved to this stage, he or she will automatically receive an invitation to Abacus. Click SAVE LEVER again. From here, you're ready to begin the reimbursement process with your interview candidates! Please note: the 'owner' of the candidate in Lever will be automatically assigned as their Manager in Abacus.